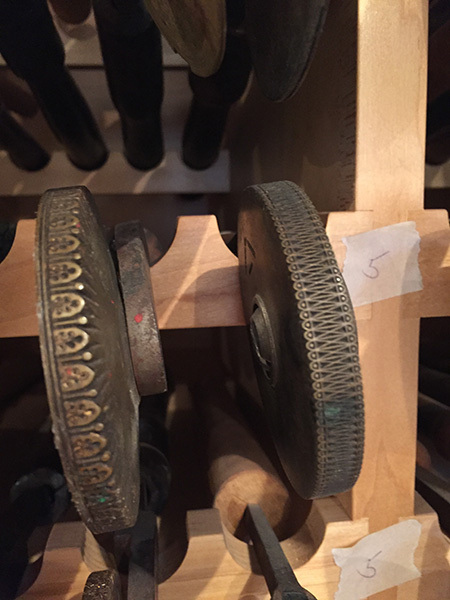 I am looking for a source to use for cataloging a collection of bookbinding tools. Wheels, scallops, and other ornate brass decorative stamping tools. They are very old and I wanted to see if anybody knows of a resource to name and identify these unbelievable tools. Some have a manufacture name on them but most don’t. I wanted to see if they had names when they were cast or a catalog that numbered them or something. Thanks. I have attached a picture of some of the wheels.